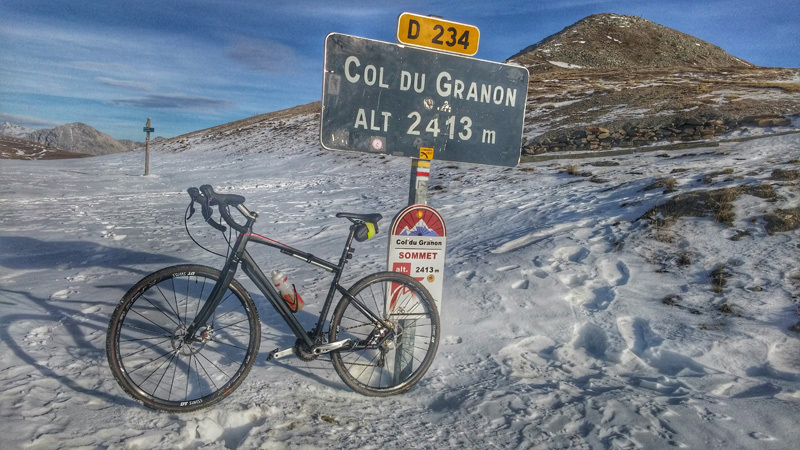 The start of the season gets off to a slow start and there's no white Christmas in the Alps. 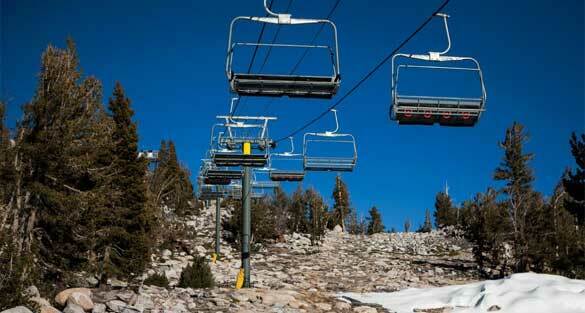 With wall to wall sunshine, perfect for sunbathing but not for snow cover, few resorts can fully open. So what to do in a Snow Drought? IT'S NEARLY CHRISTMAS - SNOW GODS WAKE UP! Yes, we're back! STYLE ALTITUDE is now operating from the mountains for the rest of the winter. We're in Serre Chevalier in the Southern Alps - and the webcam is back on. But, er, don't look if you're planning on coming here for Christmas because the Snow Gods are taking their sweet time to awaken. But the temperature is dropping like a stone, as the sun goes down so the good news is the snow cannons are blasting, currently leaving huge mounds of snow ready to be flattened out on the pistes. 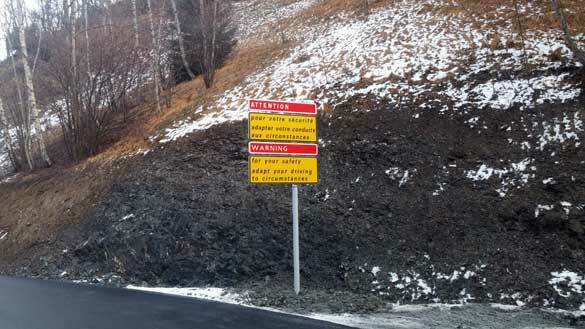 The other good news is that the new Lac du Cambon road on the other side of the lake to the old road that shut in April because of the tunnel damage, is actually open. 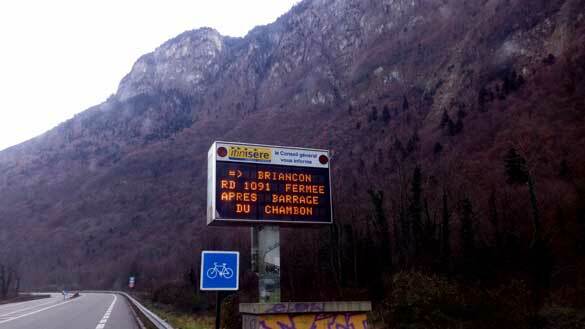 Not that they are encouraging anyone to go that way - all the signs up from Grenoble to Briancon are showing the route closed. When we arrived at the dam, it still wasn't clear that there was any route except up to Deux Alpes - we had to manoeuvre passed road workers down a very narrow bend. Nothing over three tons is allowed but there's no reason why any other traffic can't go that way instead of detouring via the Frejus Tunnel (and having to pay). But, and it's a big but, the road is very narrow especially where it is single track with traffic lights so going this way when it's icy would be brave. Also, if a lot of cars start using it, as they might in the holidays, it's going to be deadlocked. 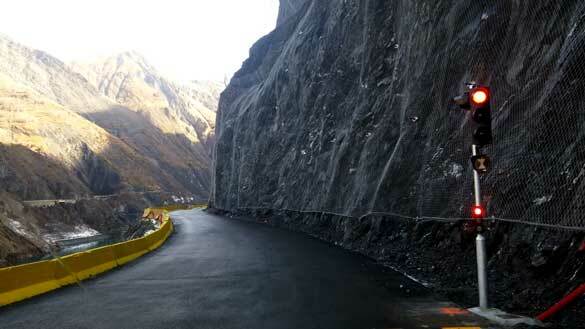 The sign at the beginning of the road warns: Adapt Your Driving To Circumstances. It's not kidding. So we went up at around 13.00 having spent half an hour in the ski lift office, trying to collect our already paid for season passes! A lot of faff with trainee staff trying to find our references and the computer saying 'no'. Eventually, we made it up on the Casse du Boeuf chair, then down to Foret and back up across to Serre Ratier. All perfectly skiable (see pic below) but that's about it for now as it seems they're waiting until this weekend before spreading more piles of canoned snow. Club Med are expecting 700 guests on Sunday. So helmets on, cos the pistes are going to be rammed! Certainly this is when you need some good pistey skis. I was riding my new Nordica El Ninos with 100m waist. Not exactly piste skis but I call these my Eventers as they're strong for backcountry (crosscountry) but also light for piste (dressage). The other skis in my stable are The Hacks (all rounder SCOTT Realms), The Hunters (Armada VJJ powder skis) and The Show Ponies (SCOTT Cruis'Airs, lightweight tourers). You guessed it, I spent a long time on horses before riding skis. I realise now that I could do with some Polo Ponies as in quick turning piste skis! 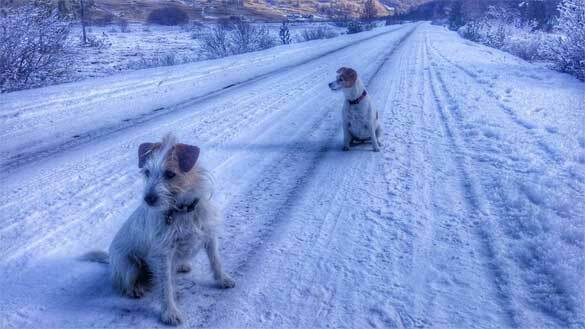 We spent two hours in the office up the hill, this morning. The Prorel lift is open which extends the area - and we skied all the way back to Frejus from the top of Aravet, even though it was closed off. It was perfectly groomed, obvioously awaiting the weekend before opening. But we claimed Seasonaires' rights! We rode from 10am to 12 noon and it was amazingly quiet except for the UK school groups. Got home and Gavin did a quick change into Lycra and has gone on the bike up Granon! Blue sky and still no sign of snow in the Alps. But the manmade is holding up thanks to the cannons and cold nights. Yesterday, we spent three hours in Briancon hospital as our daughter stacked it spectacularly off the side, taking out a piste pole and hurting her knee. She bravely skied down, but in obvious agony. With two torn ACLs already in the family, we feared it was a hat trick. Fortunately, it's a strained ligament not a tear or break! So it's sofa rest watching Christmas films on TV for a couple of days. Anyone catch Barack Obama with Bear Grylls in Alaska, last night? Good to hear the message put across about receding glaciers and climate change. What if waiting for snow was all winter, every winter? Do something and join the snow sports community influencing change via Protect Our Winters. But, if you're in or going to a ski resort, stay calm. The cannoned pistes are perfectly skiable and this snow drought has fired the imaginations of the resort community, offering alternative activities. Here in Serre Che, for example, Ski Connections are holding a fancy dress Olympics on Christmas Day involving teams of four, snowshoes, cross country skis, sledges and Jagermeister! Yep, we'll be there. Meanwhile, following our own advice in Snow Drought Alert, our other (uninjured) daughter decided to learn to snowboard and had a two hour lesson, yesterday. The nursery slope may have been a tad crowded but she was soon getting the hang of it and, apart from the usual bruising, she's now motivated to carry on and nail it. Today, we'll be back up the hill and then we have an all girl outing to the swimming pool and spa at Monetier, this afternoon, while Gav goes cycling! Although he fell over our deckchair on the patio, last night, and is, also, bruised! The chair is beyond repair; not sure about our Tech Editor. Last night, we also entertained ourselves watching our old ski and snowboard videos. Here's a snowy La Grave and Cucumelle, 2001 with riders Jez Wootton, Andy Sloane, Ed Junnell, Gavin Baylis, camerman, Simon Bedford and, featuring the legendary guide, Per As ON A SNOWBOARD! Babylon - La Grave 2001 - Simon Bedford from Weathercam on Vimeo. Tans are coming on nicely - topping up today with more wall to wall sunshine in the mountains. Meanwhile, we're hearing that Avoriaz is opening up their mountain bike park and the nets are back up on the tennis courts in Alpe d'Huez. And there are chain gangs of skiers and snowboarders clearing the rocks off the pistes in Deux Alpes. 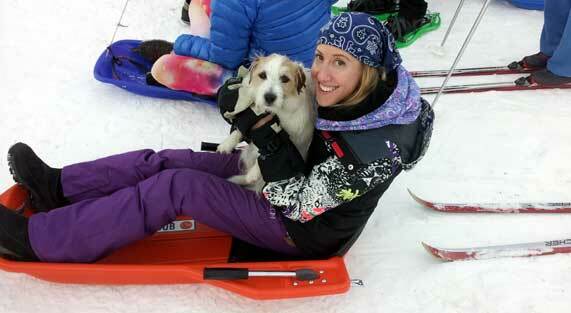 Here's what we suggest to do in a snow drought. But spare a thought for businesses in resort - mountain restaurants that can't be reached, chalet bookings cancelled, last minute holidays to the snow non existant. It started with Bucks Fizz (champagne and orange not the 80s pop group) at 11am followed by a family ski on the hill. At 3.30pm we were wearing bandanas and taking part as our team, The Prats Of The Caribbean, in the fancy dress Xmas Olympics organised by Ski Connections outside La Grotte at Aravet in Serre Chevalier. The race consisted of sledging (eating an oyster and drinking shots), cross country skiing (minus poles and having to burst balloons with skis), snow shoeing (eating five marshmallows and going around a pole five times) and snow scootering (dressed as Santa and carrying parcels). 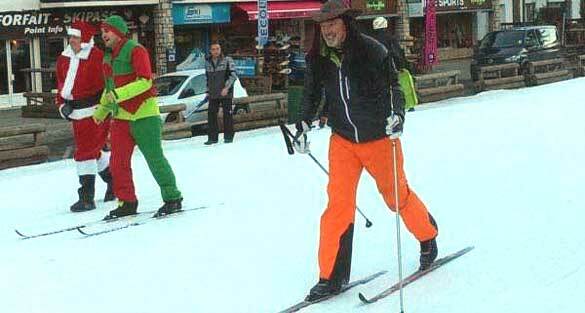 Gavin drew the short straw on cross country skis (below) but wasn't allowed the poles! Meanwhile, today is wall to wall sun again with not a snow cloud in sight! Midday and the sun is shining, once again. Up the hill, we're lapping the runs that are open - keeping to The Sunshine Laps where the runs are not in the shade but, honestly, spending more time on the lifts going up than riding down. We're due a few centimetres on Thursday, here in Serre Chavalier. But not getting the powder skis out just yet. The resort here is certainly busier with the post-Christmas mob. 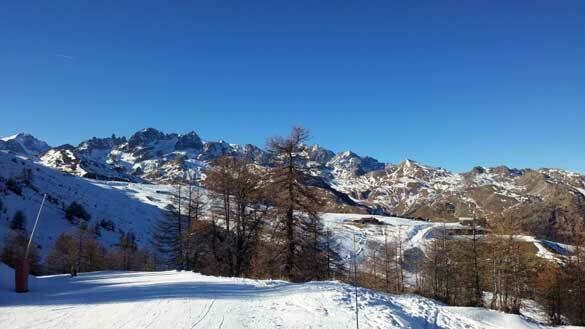 The pistes were crowded, yesterday, even though there were no queues for the lifts. But passing Montgenevre, this morning, on the way back from dropping our daughters off at Turin airport, there was a large queue for one of the few chairs open. Meanwhile, we hear that it is finally snowing in Japan. 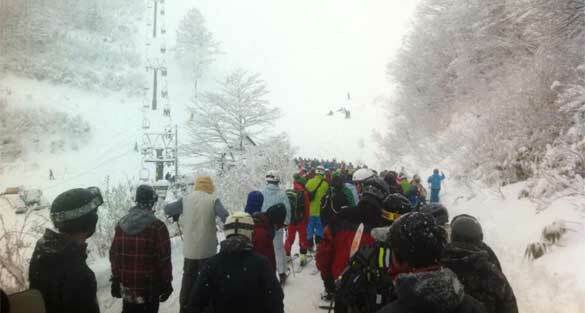 Only problem is, the whole of Tokyo has headed for the slopes, creating epic queues (below). Another wall to wall sun day! And the pistes are only just holding up under the strain of the post Christmas hordes. Queues are inevitable. Today, we passed the spa at Monetier on the way back from walking up Galibier. There was a bigger queue for the baths than for the one chair working! Coming down from the Galibier, we spotted cyclists, walkers and one guy skiing over the grass. We met Joe Vallone, legendary mountain guide, at the Col du Lautaret and sympathised with the lack of lift opening in La Grave so he couldn't even take clients to learn glacier terrain awareness. But he did endorse the idea of grass skiing, maintaining that La Grave has some of the best grass ski conditions in the world! He, then, left us to go and do a snow dance in La Grave. And we're practising what we preach in Snow Drought Alert - one daughter has been learning to snowboard, the other went running and, yesterday, we took the Rando Chiens for a bike ride (Gavin) and run (me) to explore a ski touring route over at Cervieres to La Chaud, below Montgenevre. Racing down with Gavin on the bike was a bit of a workout for the Rando Chiens, getting them ski tour fit for when the snow eventurally comes. And, talking of the white stuff, the Snow Gods are finally stirring. Looks like snow on Saturday. Which is good news for us; not so good for tour ops on transfer day!